When I first starting researching my father’s family I hit a blank wall. I had even tried searching the name in the Dutch online database, Genlias, without success. Then through searches on Google and Ancestry, I verified my suspicion that our family surname had been changed to Reyst once my great-grandfather and his family arrived in the United States. Our real Dutch family surname is Reijst, and generations before my great-grandfather it was Rijst. A quick study of the Dutch alphabet revealed that although “y” does exist in the Dutch language it is seldom used as a vowel, and was not even used in older records. Instead the digraph (a pair of characters written to represent one sound) “ij” is considered a single letter in the Dutch language and represents the sixth vowel. Often writers failed to dot the i and j, so written in cursive it looked like a “y”. This explains why on the Obdam manifest, the surname appears to be Reyst, whereas the first US Census record of 1900 that my great-grandfather participated in lists his surname as Reijst. Between 1890 and 1900, my great-grandfather used both variations of the surname, but thereafter the family’s surname was identified as Reyst. So why the change in spelling? It likely has a lot to do with where my great-grandparents chose to settle down once arriving in the United States. Many Dutch immigrants settled in Michigan from 1840 to 1900, especially on the western side of the state around Grand Rapids. Many of the Dutch Protestant families continued to cling to their native traditions, and most surnames found in city directories of these western Michigan towns and cities resemble those in their native provinces of the Netherlands. Most familiar is Frederik Meijer, the founder of the grocery business that has now grown into a major superstore chain that still bears his name. But my great-grandfather, Johannes Reijst, decided to migrate to the growing metropolis of Detroit, Michigan, which was quickly becoming an important emerging industrial center of the Midwest. Detroit was growing from an influx of people from various origins and cultures, from southern United States and both Eastern and Western European countries, and economic opportunities were likely greater for those who assimilated into this new culture. So either by design or by accident due to misinterpretation, the “ij” in Johannes’ surname was replaced with a “y”. The family even took this assimilation into American culture a step further by converting their given names to more familiar Americanized names. So Johannes became known as John and Helena as Lena; even the family given name of Cornelis, now would be written as Cornelius. The Reyst (or Reijst or Rijst) surname probably dates back to no later than 1811. Prior to 1811 very few Dutch families had surnames, except nobility. But in 1811 under Napoleonic rule of the Netherlands, all families were required to register and choose a surname. Among the rural population of the Netherlands the use of patronymics was common practice before 1811 to identify an individual, with the oldest form using the possessive of the father’s name along with the word for son or daughter. Other forms used a person’s occupation, place of residence, or personal characteristic. So many patronymics became permanent surnames, like Jansen (son of Jan), Visser (the fisherman), Van Dijk (one living along the dike), and Reus (nickname for big man). So what does the name Rijst or Reijst represent? Unfortunately, I have not been able to find any citation that gives the meaning of either of these spellings. But I have found out that the Dutch word “rijst” means rice (as a noun) or to lift, mount or heave (as a verb). So it is possible that the chosen surname may have referred to being someone who does manual labor as I don’t think it referred to growing or processing of rice. Also the Dutch word for the Rhine River is “rijn”, so maybe the surname has some connection to living along the Rhine. Today in the United States individuals with the surname of Reyst are mostly located throughout Michigan. However, you will also find some possible relatives in Arizona, California, Florida, Georgia, Indiana, Kentucky, Texas, Virginia, and Washington. Today’s Woodward Dream Cruise, the antique car and hot rod cruise down Woodward Avenue from Wide Track Circle in Pontiac to 8 Mile Road at the edge of Detroit which draws car collectors from across the United States and Canada, triggered old memories of my dad. So I hope you don’t mind my brief diversion today. In the last few years of his life, my dad, Arie “Harry” Reyst, started buying 1950 cars, I think they were all Chevys, and fixing them up in his spare time. I particularly remember 2 such cars, a white Chevy and a red Chevy convertible (which he still owned at his death). The white Chevy, which was probably a 1955 or 1956 model, he gutted under the hood completely and rebuilt it, replacing bad parts and even spray painting parts so they appeared new. I remember Dad hanging the parts from my mom’s backyard clothesline at our house on Eastburn Avenue. 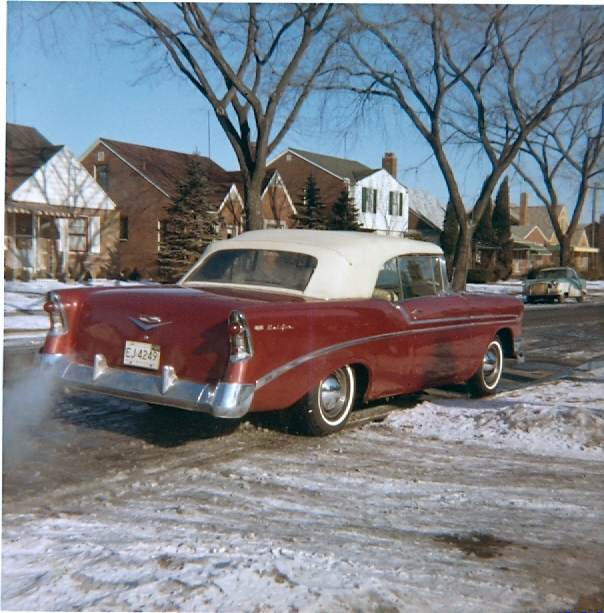 Harry sold this one and later purchased the 1957 Chevy Bel Air convertible, which my sister, Kathleen, had to drive if she wanted to borrow a family car. Some of those Sunday afternoon family drives were taken in these cars. So I know if my dad still had been alive in 1995 when the first dream cruise was organized, he would have been right there cruising one of his beauties with all those youngsters, beaming his big smile. Riding in dad’s old cars, you felt special; there was this sense of pride and joy, and in my dad’s case love. So I can relate to those thousands (they say some 30,000 collector, custom, muscle, street hot rods, and special interest cars will cruise Woodward Avenue today) of owners who have come out today to cruise on by the million plus spectators along the route. I have often wondered if some car buff discovered that red ’57 Chevy on the dealer’s used car lot after it was traded in for a new car around 1966. Maybe it was spared the junk yard and can be seen cruising along in one of the many car cruises, in addition to the Woodward cruise, held throughout Metropolitan Detroit area every summer.